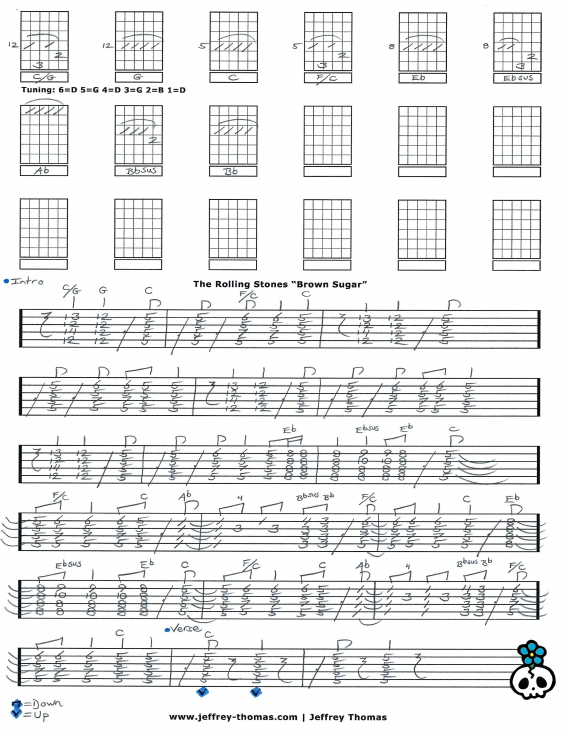 The Rolling Stones Brown Sugar Free Guitar Tab by Jeffrey Thomas. I spent a lot of time on this guitar tab for sure. Learn the proper tuning, chords, fills, song structure and licks for this classic rock tune. This is a must know tune for any bar band! Keith Richards is at his best here on this tune. Many of my students are into classic rock and Brown Sugar is at the top of their lists for guitar songs to learn. Want the full guitar tab for free? Just send in your email address through the form provided and I’ll send it off to you. Looking to improve your rock guitar playing? Make sure to fill out the Schedule A Free Lesson form to set up your free Skype guitar lesson today! “Brown Sugar” was ranked #5 on Rolling Stones list of 100 Greatest Guitar Songs Of All Time. Find more great online guitar tabs on my video, tab and blog pages.